OK! I am freakin’ out, man! FREAKIN’ OUT! 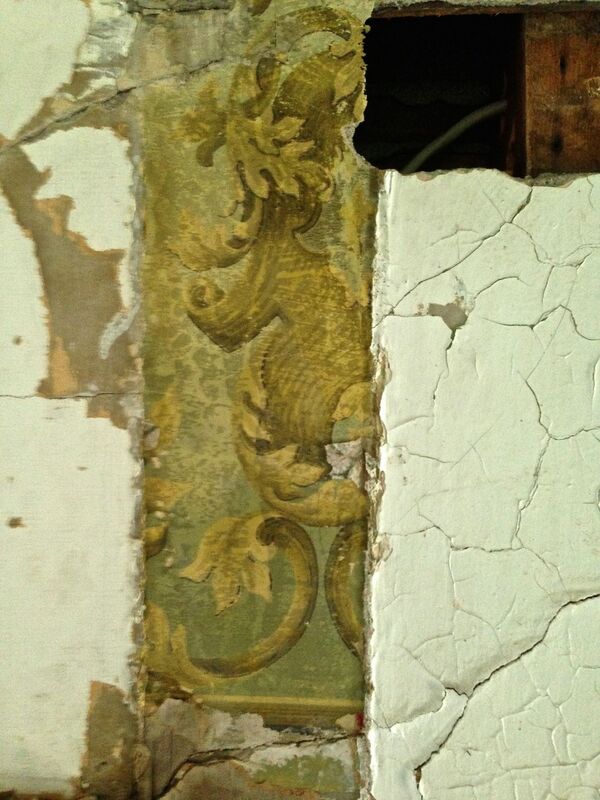 Recently, I did a post on the wallpaper discoveries at the Cross House. In particular, I found scraps of the original 1895 wall paper, wall frieze, and ceiling paper in the two-story stair-hall. Were these scraps, I wondered, enough to recreate all three papers? I mean, how cool would it be to have the original papers re-installed after 120-years? OK! So that is an update. I have doing research into having the papers reproduced. As part of this endeavor, I contacted Bo Sullivan, whom I have known for several years. Bo wears many hats, and all related to old houses. Obviously, a must know kinda guy! 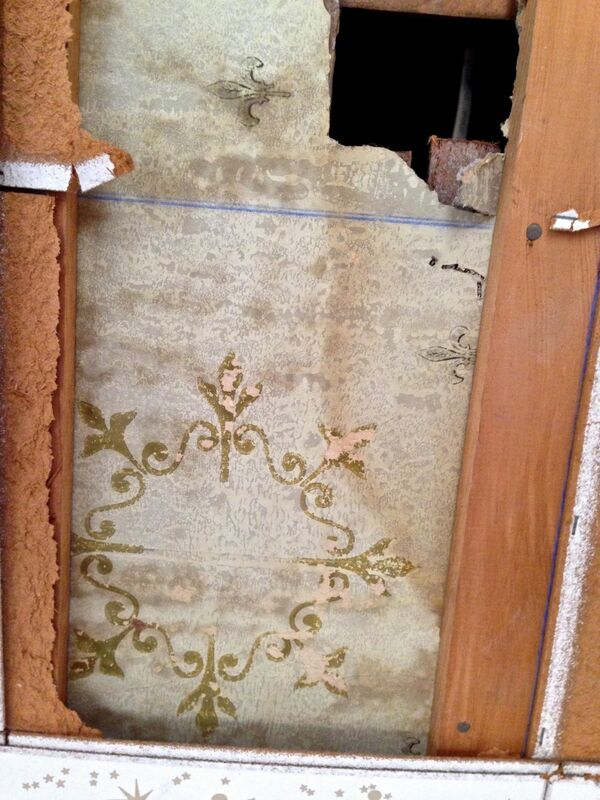 Bo also started a company called Bolling & Company, which sells antique wallpaper fragments mounted as art. Cool idea. Gorgeous stuff. 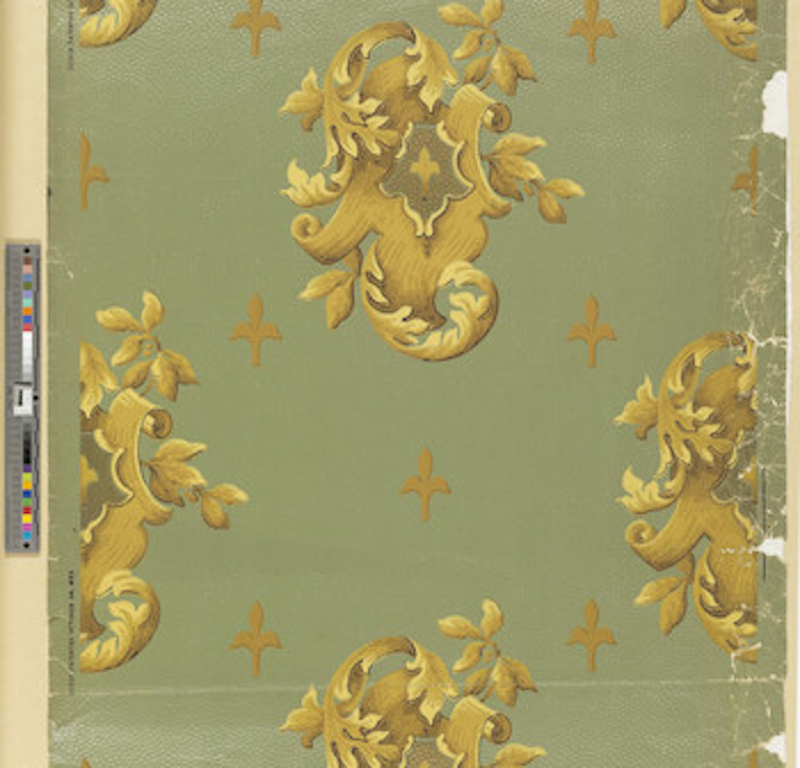 Bolling specializes in the work of M. H. Birge & Sons, a Buffalo-based company which produced wallpaper from 1834 to 1982. At the time the Cross House was built, Birge was producing luscious, high-quality papers. Bo found the sample in the collection of Historic New England. AND I LOVE IT! Interestingly, from what remains in the house I would never have guessed that the “shields” were asymmetrical. Cool. I am an asymmetrical kinda guy. My paper also had a silver ground, and not the green in the sample. The paper was patented in 1893, the year before the Cross House was built. I knew I had enough of the ceiling paper to recreate it. Now I have enough of the wall paper to recreate it. Whoee! The frieze? Ah, no. But now I am hopeful! It is out there somewhere! The hunt begins! Now, Bo is a Birge nut, oops, aficionado. The man LOVES Birge. Well, he very kindly looked at my pitiful scraps. Then a lightbulb went off. And Bo got really really really excited. Are these, could it be possible, can these scraps be by…BIRGE? I would love to have seen his face when he confirmed Birge. You know, I so love a good nut, oops, aficionado. 3 Responses to FLASH NEWS! Wallpaper UPDATE! Wallpaper wonderment! Bo is amazing! What a great friend & aficionado! 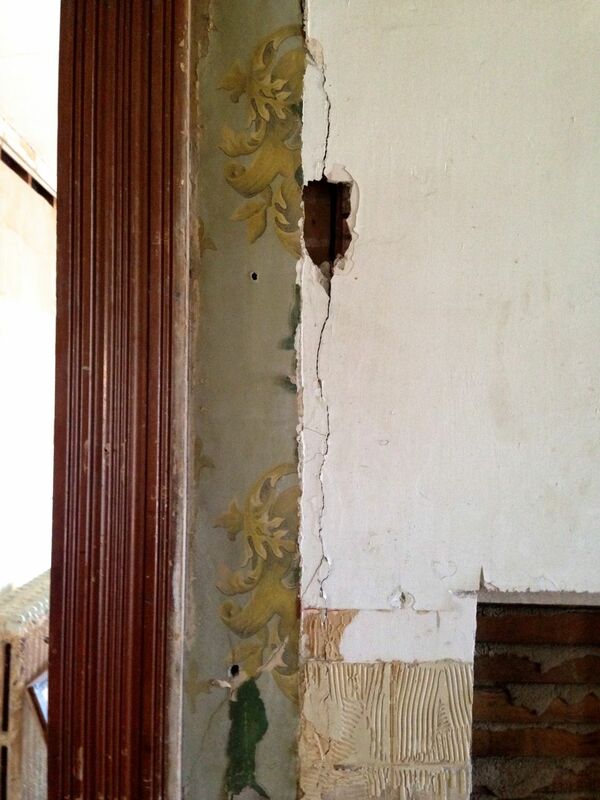 The wallpaper is so beautiful and to find enough scraps. That is just the ticket. Way to go Ross!